Not all tax resistance has to do with grand global issues or conscientious objection; some is just the protest of people who feel they’re getting shafted by a government that takes too much and provides too little. Case in point: Scott Frisby of Southend. He says the government has failed to provide even the minimum of services, and so he’s dropping his subscription (or at least 25% of it). Scroll down to the bottom to read the hilarious response from Southend Council’s customer service department. The Indianapolis Baptist Temple started refusing to pay federal taxes in 1983 , when pastor Gregory Dixon “decided the church would break all ties with the government and no longer act as its agent in withholding taxes from its employees,” citing Constitutional freedom of religion as his mandate for taking his church out from under Uncle Sam’s thumb. For several years, nothing came of this defiance, but in the early 1990s, the IRS started seeking back taxes, eventually filing liens against the church and against Dixon. The church fought back in court, but lost a series of appeals, finally getting turned down by the U.S. Supreme Court in 2001 . Here’s the story, with links to the court opinions. War Resisters’ International has released their Handbook for Nonviolent Campaigns for free, on-line. A populist form of tax resistance is aimed at speed and red-light cameras that scan license plates of offending vehicles, snap photos of the drivers, and automatically issue traffic tickets. These cameras are more a revenue-raising program than a safety-encouraging one, and they’re causing lots of resentment. A driver has racked up dozens of speeding tickets in photo-radar zones on Phoenix-area freeways while sporting monkey and giraffe masks, and is fighting every one by claiming the costumes make it impossible for authorities to prove he was behind the wheel. Arizona began deploying the stationary and mobile cameras on state highways a year ago, and through Sept. 4 had issued more than 497,000 tickets. Of those, about 132,000 recipients had paid the fine of $165 plus a 10 percent penalty, netting the state more than $23 million. Arizona is the first to deploy such technology on highways statewide. Many of the remaining tickets are either new, being appealed or have just been ignored. The state didn’t have figures immediately available on the breakdown. Many believe the shooting death of speed-enforcement van operator Doug Georgianni on April 19 on a Phoenix freeway was a result of anger over the cameras, although authorities haven’t made that direct allegation. Tax resister NTodd Pritsky shares some meditations on civil disobedience, complicity, and knowing how much of yourself to devote to a better world when it seems like even 100% isn’t enough. Forbes reports that a Treasury Inspector General for Tax Administration investigation turned up evidence that IRS employees are issuing huge fraudulent “refunds” for fun and profit, but the IRS doesn’t have procedures in place to keep track of how manual refunds are generated, so nobody knows for sure. In the second section of the fifth book of The Nicomachean Ethics , Aristotle continues his examination of the virtue of Justice. In the previous section, he noted that to the extent that justice is defined as conformity to the law, and to the extent that the law encourages virtue and prohibits vice, Justice and Virtue overlap. In this view, Justice isn’t a virtue but is equivalent to Virtue (or at least to a public subset of it). But in this section he says that in a second sense of “Justice,” it is a particular virtue of its own. This variety of justice concerns fairness, as in “one’s fair share,” and you are just if you only attempt to obtain what’s coming to you, and you’re satisfied only with what is your due. Whenever, through force or fraud or unfair advantage, you try to get more than your share of goods, you are acting unjustly, in this sense. Is he talking about an actual or an ideal legal system here? It’s odd that he doesn’t qualify this phrase in any way, by prefacing his comments with something like “in the best of the legal systems I have studied…” or “when the laws have been made wisely…” Logically, if all that is unfair is unlawful, then nothing that is lawful is unfair (assume, pedants, that nothing is both lawful and unlawful and that everything is either one or the other). Put that in a context where Athens had, only a generation before, lawfully put Socrates to death for philosophizing too vigorously (Aristotle himself would flee Athens, anticipating another legal lynching of an inconvenient philosopher). It’s almost as though he is speaking of “the law written in their hearts” that Paul wrote about in Romans . But I don’t think he is. I think he’s describing a real-world, explicit, man-made legal system of some sort. Maybe he means a combination of explicit law and implicit custom & tradition. Or maybe he is referring to what the ideal law ought to look like. It’s really hard to tell at this stage. Aristotle does note that “perhaps it is not the same to be a good man and a good citizen of any state taken at random,” and says he’ll deal with this subject later (again, I worry that “later” may mean in the Politics rather than later in this book). For now, he wants to begin subdividing this virtue of particular justice so he can investigate its components. The two main categories Ross translates as distributive and rectificatory (distributive and corrective in Rickaby’s diagram above). The first of these has to do with those goods (not just physical goods, but privileges and the like) that are the common property or the creation of the polis as a whole. How should these be divvied up? How do you know what your fair share is? This is the domain of distributive justice. Rectificatory or corrective justice concerns individual transactions between people. How do you know when each person in the transaction has been treated fairly and ends up with their fair share, or when one person has unfairly gained the upper hand? And what do you do to rectify/correct the situation once an injustice has occurred? 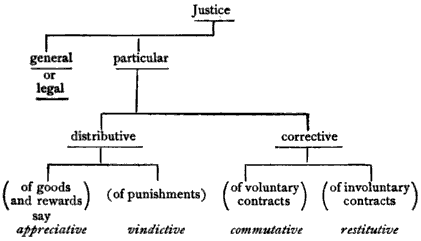 The following sections will look into these varieties of particular justice in detail.